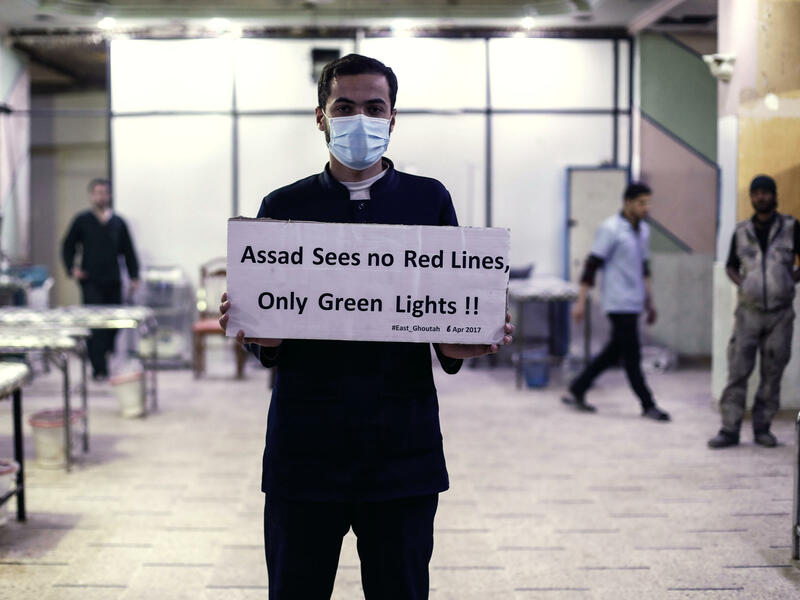 A medical worker at a Damascus hospital holds a sign protesting a suspected chemical weapons attack outside the Syrian capital a year ago. The suspected attacks led the U.S. to fire a barrage of missiles at a Syrian air base on April 7, 2017. Faced with the threat of U.S. military action and prodded by longtime ally Russia, Syria declared in September 2013 — two years into its civil war — it had ratified the 1997 Chemical Weapons Convention banning the production, storage and use of chemical weapons. A letter from Syrian President Bashar Assad sent at the time to the United Nations' then-Secretary-General Ban Ki-moon promised that Syria would immediately comply with its CWC obligations. The following year, then-U.S. Secretary of State John Kerry declared the U.S. had struck a deal with Syria "where we got 100 percent of the chemical weapons out." And yet reports of a chlorine gas attack over the weekend on a rebel-held enclave outside Damascus constitute just one of many reported instances of chemical weapons use in Syria since Assad ratified the CWC. 1. How do we know Syria has possessed chemical weapons? It was Syria's own Foreign Ministry that confirmed in 2012 that the nation held chemical weapons, many of them developed in the 1970s with help from the former Soviet Union and Egypt. A spokesman for the ministry vowed the weapons were intended to defend the country against "external aggression" and would never be used against the Syrian people. 2. Wasn't the elimination of those weapons required under the CWC? Both production facilities and the chemical weapons themselves were to be destroyed. The Hague-based Organization for the Prohibition of Chemical Weapons, through on-site inspections and unfettered access, was responsible for "stringent verification" that the terms of the treaty would be observed. 3. How would the OPCW know which chemical weapons existed and where they were located in Syria? 4. Didn't the CWC also call for the elimination of chemical weapons worldwide? That is the aim of the CWC, and 190 nations have ratified the treaty. Four have not: Egypt, Israel, North Korea and South Sudan. Others have long surpassed the 10-year window following ratification during which their chemical weapons stockpiles were to be destroyed. The U.S. ratified the CWC 21 years ago this month, but as of December 2015, it had not yet destroyed about 10 percent of the 27,771 metric tons it declared, including sarin and mustard gas. 5. Is the chlorine gas allegedly used in the latest attack banned under the CWC? Using chlorine as a weapon is banned, but chlorine itself is not proscribed by the CWC. Unlike other substances that fall under the treaty, such as sarin and mustard gas, chlorine is also produced and used in Syria for peaceful purposes, from cleaning products to water purification. It was not included on the list of banned chemical agents in the deal made with the U.S. and Russia.